Our CON toyger female WhiteStripes Greenwich aka Tiuhti was sent to UK, QueenAnneCats cattery for breeding. We got her back in the beginning of the July 2014 and the 30th of July Tiuhti gave us our first SBT litter. 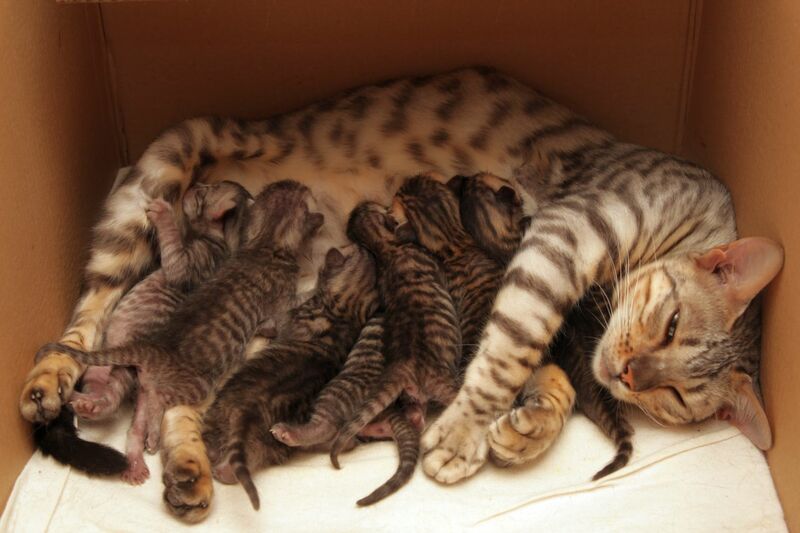 7 fantastic kittens! There are 3 females (two silvers, one brown) and 4 boys (3 silvers and one brown). Tiuhti’s delivery was easy and quick and she is very caring and tender mother. She doesn’t want to let kittens out of her sight. Kittens are well and growing up fast. More pictures coming when mom gives her permission and the kittens have developed a bit.